The 502, bmws first v8 model, and the first post-world war ii german v8, was basically the same as the bmw 501 but with a bigger engine. In addition to the factory-built four-door sedan, autenrieth and baur made customized coupes and convertibles. Total 502 output was 5,955. A warning whistle in addition to the 502 with the original square 2.6-litre engine, a model with a bored-out 3.2-litre v8 made its appearance in 1955. Two years years later the 502s was introduced, its engine increased to 140 hp by twin carburetors as well as a higher compression ratio. This raised top speed to 112 mph, making the 502s germanys fastest car. A strange whistle emitted by the engine at high speed served as a warning for other motorists to clear out of the way. The 502s received front disc brakes in 1959- big, heavy body a midline chrome strip and foglights built into the front fenders distinguished the 502 from the 501. Both sedans were built on a 112-in. Wheelbase and featured suicide doors, the front ones front-hinged and rear ones rear-hinged. In 1955 the 502 received a wraparound rear window, driving lights and more luxurious trim. A sunroof was optional. 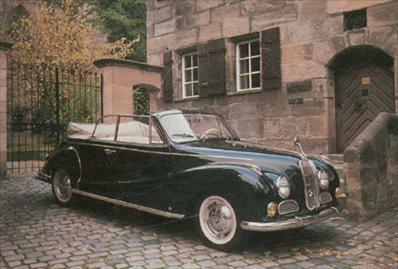 Bmw 502 coupes and convertibles were custom-built. They were rare and are quite valuable today.